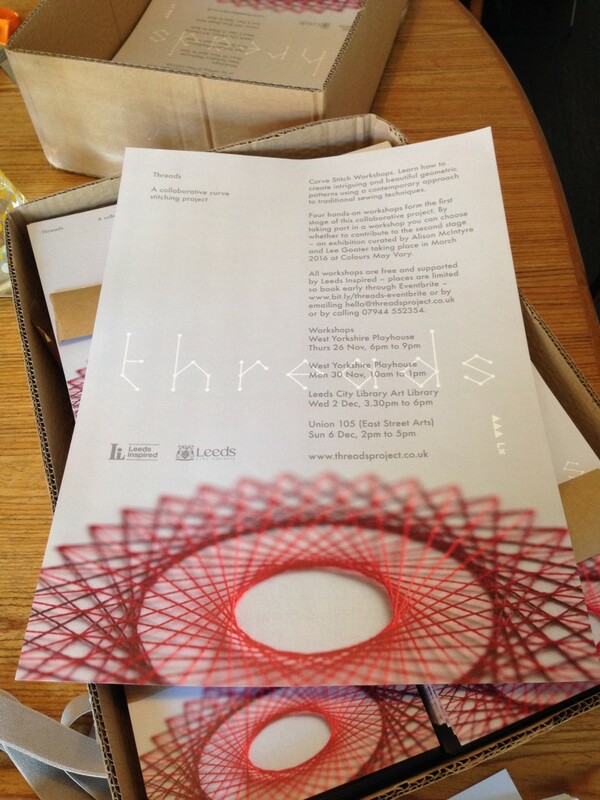 I came up with the idea for Threads earlier this year. I thought it would be great to do something collaborative with the curve stitching technique and to combine this with an exploration of what happens to conversations while groups of people are making together. I’ve been interested in this group dynamic since visiting an Amish community in 1999 and becoming fascinated with their quilt designs and the collaboration they use to make them. I’ve also been noticing the group making dynamic through my community work over the past 15 years, so it’s brilliant to be able to combine this academic interest with a technique I practise professionally. Four FREE introductory workshops, in late November/early December, form the first stage of the project. By taking part in a workshop you can learn the curve stitching technique and then choose whether to contribute to the second stage – an exhibition at Colours May Vary curated by me and Lee Goater. Have a look at the workshops page for more information and to book your place. Lee has also produced some gorgeous publicity for the project so let me know if you have somewhere you can display a poster or some flyers to help us publicise the workshops. As I mentioned above, I’m also interested in what happens to groups when we are all concentrating on this kind of making. Are we more relaxed? Do we worry less about making eye contact and filling pauses and gaps in conversation? Do we talk about different things? To explore this further I will be recording the conversations that take place during the sessions when we are making work for the exhibition in February 2016. Lee and I will then weave excerpts of the conversations into the final exhibition. We will also produce a publication to celebrate and catalogue the process of the project. I’m really excited to see how this project will come together and would love to create a model that could explore these same ideas in other settings.